5 copies of Prince Fatty's fantastic "Super Size" album to be won! 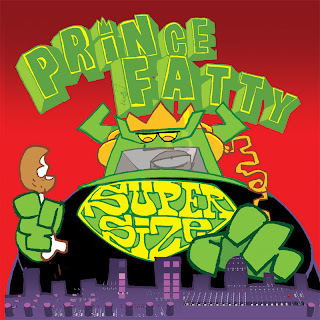 * In which UK city/town is Prince Fatty currently based? The first five correct entries I receive will win a copy of this excellent reggae album from 2010, which features guest vocals from former Studio One recording artists Winston Francis and Little Roy. * Only one entry per person and per household allowed. * This competition is only open to UK residents. * There will be no substitute prizes or cash alternatives. * We take no liability for prizes lost or damaged by the postal service. * Winners will be notified by email. Losers will not receive a reply. * The results of the competition will be published on this blog. Full names, emails and addresses will not be disclosed. * The editor's decision is final in all matters relating to this competition.